Whether you have a Poodle, Great Dane, Boston Terrier, or any other puppy, there are several supplies that you’re going to want to have on-hand to ensure that your newest family member is well cared for – like puppy shampoo. Puppies are curious by nature and want tend to get into a lot of mischief. Add to that the house training and you’re pup is bound to need a lot of baths. When it comes to shampoos, there are a lot of options to choose from. To help you pick the best option for the most playful member of your family, we’ve assessed countless puppy shampoos on the market and selected what we consider to be the five best options. Each one is specially formulated for a puppy’s sensitive skin and will leave your pooch’s coat clean, soft, and easy to manage. Below, we offer a more in-depth look at each of these five puppy shampoos. When you’re ready, click on the buttons to find the best price available on Chewy and Amazon! 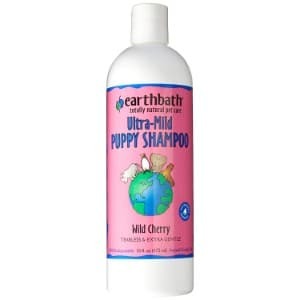 The first shampoo on our list is Earthbath’s All Natural Pet Shampoo. It’s gentle enough to use on a puppy’s sensitive skin, yet powerful enough to clean away all of the dirt and debris your four-legged family member is bound to pick up when he’s exploring you’re fenced-in yard on his own, or even while you’re walking him on a dog collar. Earthbath specializes in shampoos that are good for puppies and good for the environment, too. This top-rated puppy shampoo is made of all natural ingredients, including aloe vera and olive oil squalene. It’s also free of harsh chemicals, such as dyes, perfumes, parabens, and phosphates. It’s also available in a variety of formulas and scents (and all scents are derived from natural ingredients), such as a tear-free and hypo-allergenic formula, and a eucalyptus and peppermint, a wild cherry, and a eucalyptus and peppermint scent. And, all of the shampoos are “soapless”, which means that they won’t wash off any flea treatment for dogs that you may have applies to your puppy. Earthbath is committed to making shampoos that are good for puppies, as well as the environment. All of their shampoos are biodegradable, which is another reason to love this top-rated puppy shampoo. Since Earthbath’s line of shampoos are made of all-natural ingredients, they won’t harm your puppy’s skin or coat, and they won’t damage the planet, either. Users of Earthbath All Natural Pet Shampoo have stated that they’ve tried other products on their puppies, only to find that they stripped their coats or damaged their skin; these users said that this was the shampoo that was delicate enough for their puppies sensitive skin, yet powerful enough to cut through all of the dirt and odor that they pick up. It also leaves the coat easy to manage and smelling great. Next on our list of the best puppy shampoos is Wahl Puppy Shampoo – Gentle Formula. What makes this a good shampoo for puppies is, like all of the other products on this list, it’s specially formulated for your dog’s sensitive skin. It’s free of harsh chemicals, like PEG-80, an additive that is used in many other shampoos and has been found to cause serious irritation. Instead, it’s derived of natural ingredients, like chamomile and coconut oil. This gentle formula is safe for regular use, so if your puppy is always getting into messes, you’ll have peace of mind knowing that this shampoo won’t damage his skin or coat. Wahl’s Gentle Formula Puppy Shampoo creates a thick lather that rinses clean, making it extremely easy to use. 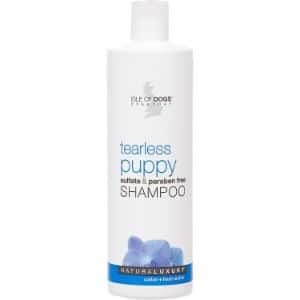 It’s also a no-tears formula, which is another reason why it’s a great puppy-safe shampoo. This shampoo will also leave your pup’s coat easy to manage, making it a great choice for long-haired breeds, like Pomeranians, Cocker Spaniel, and Shih Tzu puppies. And, because it’s a concentrate, you only need to use a small amount to get your pooch clean, which means it will last you a lot longer than other products on the market. User reviews on Amazon reveal how awesome this puppy shampoo truly is. Users say that they’ve tried other products before, and Wahl Gentle Formula Puppy Shampoo blows all of them away. If you’re looking for something that is safe for your pup, easy to use, and is affordable, this is the puppy shampoo for you! Next on our list of good shampoo for puppies is Isle of Dogs Tearless Puppy Shampoo. In fact, this shampoo is so safe that dog groomers and owners have actually lapped up some of the bath water that contains this shampoo with no adverse effects! Now, that’s a safe puppy shampoo! It also won’t irritate those sensitive puppy dog eyes, which makes this a great product for white and light colored dogs that are prone to tear stains, such as West Highland White Terriers, Russel Terriers, and Bichons Frises. Isle of Dogs Tearless Puppy Shampoo is a sulfate and paraben free shampoo, which means that it won’t strip your dog’s skin and coat of natural oils or cause irritations. The cotton and fresh orchard fragrance is delightful and this shampoo contains natural odor neutralizers, so it will truly leave your four-legged family member smelling fresh and clean for days. As a matter of fact, some Amazon reviewers have said that the scent lasts for days after they’ve washed their puppies with Isle of Dogs Tearless Puppy Shampoo. Another reason to love this dog shampoo for puppies? – It’s easy to so easy to use. Just apply a small amount to your pup’s coat, work it into a gentle lather, and it rinses clean without any issue. It will also take out mats and tangles, leaving your companion’s coat easy to manage. Burt’s Bees is a well-known manufacturer of wellness products for humans. They make lotions, chap sticks, shampoos, conditions, and other products for sensitive adult and baby skin. After hearing so many dog owners complain about not being able to find high-quality pet supplies that don’t cause irritation, they decided to start making a line of dog products, too. The Tearless 2 in 1 Puppy Shampoo from Burt’s Bees is an excellent choice for all breeds. It’s made with the highest quality, all natural ingredients, so it’s safe for use on that sensitive puppy skin. This puppy shampoo contains buttermilk, which is meant to sooth the skin and soften the hair, and linseed oil, an ingredient that deeply conditions the coat. It’s free of harsh chemicals, such as sulfates, dyes, and fragrances, and it is pH balanced for a puppy’s sensitive skin, so you’ll have peace of mind knowing that you won’t be inflicting any harm on your pooch when you scrub him down with this best puppy shampoo and conditioner. 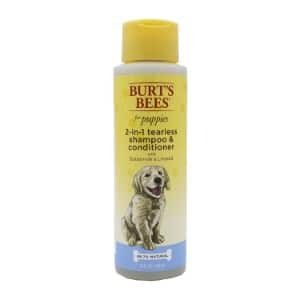 Burt’s Bees 2 in 1 Puppy Shampoo is so safe and effective that it’s actually a top veterinarian recommended formula. It’s also safe to use with topical flea and tick treatments, as it won’t wash them off. Users who have used this shampoo and reviewed it on Amazon said that it effectively removed pungent smells and that it doesn’t irritate skin or eyes, and leaves coats shiny and easy to manage. 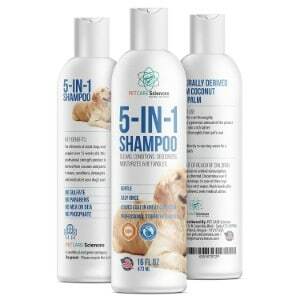 Last, but certainly not least, on our list of the top puppy shampoos is Pet Care Sciences 5 in 1 Dog Shampoo. This truly is a shampoo that can be used with dogs of all ages, including puppies who have sensitive skin, dogs that have long and hard to manage coats, such as Giant Schnauzers and Pekingese, and dogs that like to explore and roll around in less than desirable smells, like American Staffordshire Terriers and English Bulldogs. What the Pet Care Sciences shampoo apart from other dog shampoos is that it’s a 5 in 1 formula; it cleanses, conditions, moisturizes, deodorizers, and detangles dogs. So, if you have a few dogs and they’re different breeds, you’ll have each one of them covered with this shampoo. This shampoo is also free of sulfates, parabens, phosphates, DEA, MEA, and other harsh ingredients that are commonly used in other dog and puppy shampoos. Instead, it’s a natural formula that’s made from palm and coconut oils, and it contains 96 percent coconut. The formula is very thick, which makes it easy to apply to your dog; no need to worry about your pup shaking it off before you even get a chance to work it into a lather. It also rinses clean with ease, so there’s no residue buildup. Users say that the 5 in 1 Dog Shampoo from Pet Care Science leaves their dogs smelling great and doesn’t cause any irritations. If you are thinking about adding a puppy to your family, there are a lot of supplies that you’re going to need. Some of those supplies are pretty obvious, like a dog crate and a dog bed. If your pooch is going to be spending a lot of time outside, you’ll also need supplies that will keep him safe and protected outdoors, like a dog house, a dog playpen, or an outdoor dog kennel. There’s another essential supply that you’re also going to need: puppy shampoo. Bathing your puppy is a very important part of responsible pet ownership. While it’s true that dogs don’t need to be bathed as frequently as humans, as it can dry out their skin and coat, your furry little friend is going to need a bath from time to time. Puppies, in particular, tend to get into mischief, like digging, rolling in garbage, or even examining excrement from other animals (it’s just part of their curious nature!). Some puppies even get filthy when they’re learning how to eat out of a dog bowl (transitioning from their mother’s milk to dog food can be tricky for a pup!) In order to wash away that dirt and debris and keep your puppy smelling fresh and clean, you’re definitely going to want to add a top-rated puppy shampoo to your list of must-have items when you’re stocking up on supplies. When bathing a dog of any age, using human shampoo is not recommended. It’s far too acidic for their alkaline skin and can end up causing severe irritations. While veterinarians do say that you can use a standard dog shampoo on a puppy, they may not be suitable for puppies that require frequent baths. Plus, the skin of a puppy and a fully grown dog is quite different. A puppy’s skin is much softer than an adult dog’s, which means that it’s more sensitive. You should also steer completely clear of any medicated shampoo for dogs, as these formulas are going to be way too harsh for a little one’s delicate skin. Instead of risking the chances of harming your pup, using a shampoo that is specially formulated just for puppies is in your – and more importantly, your little one’s – best interest. You love your little pup with all of your heart and want to give her the best of everything. That includes using the best puppy safe shampoo. While there are plenty of shampoos on the market that claim they are gentle enough for a puppy’s delicate skin, the truth is, they aren’t. While we were looking through all of the different products that are out there, we found that many of the shampoos that claim they are puppy safe, in reality, they aren’t. They contain harsh ingredients that can be extremely damaging to a little one’s sensitive skin. Remember, your puppy looks at you as his parent or the leader of his pack and trusts you to make the best decisions for him. That means that you should put careful consideration into all of the products and supplies that you use with your little guy, like a dog harness and a dog activity monitor, and, of course, the shampoo that you are using to bathe him. After all, you wouldn’t buy just any car seat or stroller for a human child, or use any shampoo on a baby, so why would you use just any dog shampoo on your puppy? Opt for natural ingredients. Since puppies have such delicate fabricated ingredients, like parabens, sulfates, dyes, and perfumes, can be very harsh on their skin. Instead, opt for natural ingredients, like chamomile, lavender, and coconut oil. Natural ingredients won’t irritate your puppy’s skin, and they will actually treat any issues that your little guy might be having with his skin. For example, puppy shampoos that contain aloe vera can soothe irritations. So, for example, if you discover that your pup has an allergic reaction to the dry dog food you are feeding him, and that reaction includes dry, itchy skin, using a puppy shampoo that contains aloe vera could effectively ease his discomfort. Stick to easy to use formulas. Many puppies are afraid of the bath, or think that it’s time to play and want to splash around. To make bath time easier for both you and your pup, choose a puppy shampoo that’s easy to use. A good puppy shampoo should be easy to rinse out. A lot of dog shampoos take a long time to rinse out, which can make bath time a lot more complicated. Consider using tearless shampoos. Puppies can be pretty squeamish, especially when they’re in the bath. Even if you try your best to avoid it, there’s still a chance that shampoo will get into his eyes. In order to avoid irritating his delicate eyes, consider using a tearless puppy shampoo. You will have peace of mind knowing that your pup won’t experience any discomfort if shampoo does happen to get into his eyes, and he won’t end up detesting baths. Pick a non-scented or a mild scent. Who doesn’t want their puppy to smell fresh and clean after taking a bath? That’s why so many puppy shampoos are scented; but, sometimes, the scent is just too overpowering. Remember that your puppy’s sense of smell is still developing, which means that he might found a powerful scent unpleasant. Imagine if you used a perfume or cologne on yourself that was just too overpowering? You probably wouldn’t be very happy. The same is true for your puppy. In order to avoid upsetting your dog, use an unscented or mild scented puppy shampoo. If it contains ingredients that are designed to cut through pungent odors – which the best shampoo for puppies will – your pooch will come out of the bath smelling delightful, even if the formula is unscented or has a mild scent. With so many puppy shampoos on the market, how did we go about narrowing down the options and choose the five shampoos on our list? We consulted with a team of experts, which included veterinarians and professional dog groomers who know just how important using the right shampoo for a puppy is, and who also have a lot of experience using puppy shampoos. We asked them to provide us with their input about the best puppy shampoos. They told us that the best options are those that are made of all natural ingredients, are free of harsh chemicals, are either unscented or have a mild scent, and are easy to use. With that said, we scoured the market and selected puppy shampoos that meet all of the above-mentioned criteria. Then, our panel of experts tested out each of the products that we chose on several different puppy breeds, including those with short coats single coats, and those with long, double coats. After testing each shampoo, it was determined that the five shampoos in our review were the best of the best. Each shampoo contains natural ingredients, is mild or unscented, is easy to use, and conditions a puppy’s skin and coat. After bathing each dog, it was also easy to run a dog brush through each pup’s coat; especially the breeds that had long hair. The fact that these shampoos made those long coats easier to manage is another reason why they were picked for our list of the best puppy shampoos. Your puppy is more than just a pet; he’s a member of your family. As such, you want to make sure that you are using the highest quality products available. You wouldn’t choose sub-par medications for dogs or a so-so flea collar, would you? So, then why would you choose to bathe your puppy with a poor-quality dog shampoo? Using the best dog shampoo for puppies to bath your dog offers a number of benefits. As mentioned, the best puppy safe shampoo is free of harsh chemicals, like parabens, sulfates, and dyes, and is made of all natural ingredients, so bathing your puppy with the best shampoo for puppies won’t irritate your dog’s sensitive skin, which is of utmost importance. Additionally, using a high-quality shampoo will leave your pup smelling fresh and clean, make his coat easy to manage, and will make bath time an enjoyable experience for both of you. The bottom line is this: when it comes to choosing any products for your puppy – whether it’s nail clippers for dogs, a dog hair dryer, toothpaste for dogs, or toothbrushes for dogs – you want to make sure that you are selecting a the best-quality you can find. The same is true for a puppy shampoo. Using a high-quality shampoo that is formulated specifically for puppies will clean your four-legged family member clean, refreshed, and won’t cause any adverse effects. Grooming is an important part of responsible pet ownership, and using the best puppy shampoos will ensure your furry companion has the most enjoyable bathing experience possible.